To meet the increasing demand for safe, environmentally friendly and high-performance smart materials, self-healing rubbers are highly desired. 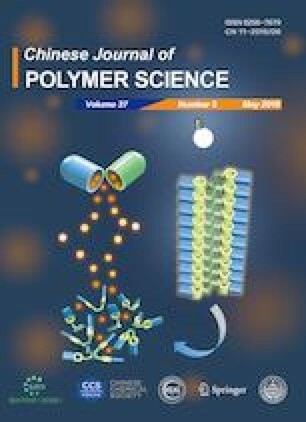 Here, the self-healing performance of ethylene propylene diene monomer rubber (EPDM) is reported, which was designed by graft-polymerization of zinc dimethacrylate (ZDMA) onto rubber chains to form a reversible ionic cross-linked network. Single ionic cross-linked network and dual network, combining covalent and ionic cross-links, could be tuned by controlling vulcanization process to achieve tailorable mechanical and self-healing properties. It was found that ionic cross-linked EPDM showed a recovery of more than 95% of the original mechanical strength through a healing process of 1 h at 100 °C. The covalent cross-links could improve mechanical properties but block self-healing. Adding 50 wt% liquid rubber to “dry” EPDM could effectively enhance self-healing capability of the dual cross-linked network and the healed tensile strength could reach 0.9 MPa. A compromise between mechanical performance and healing capability could be potentially tailored by controlling vulcanization process and liquid rubber content. Supplementary material is available for this article at https://doi.org/10.1007/s10118-019-2241-0 and is accessible for authorized users. This work was financially supported by the National Basic Research Program of China (Nos. 2015CB654700 and 2015CB654706), the National Natural Science Foundation of China (No. 51403115), and the Key Laboratory of Rubber-Plastics, Ministry of Education/Shandong Provincial Key Laboratory of Rubber-plastics of Qingdao University of Science & Technology (KF2017008). We are also grateful for the support from Hutchinson.